Webkinz still named their code! Re: Webkinz still named their code! From years past I know that they are close until about the 2nd of Jan. So I would go ahead and e-mail them again and don't expect a response right away. And again I have to contact them again This is getting very old and I know I have to wait until the 3rd before anything will be done. If any of you are Deluxe can you tell me what the Deluxe prize was for the month of Dec. I did not get mine again 5th year in a row, but this year I am going to get them to give it to me. Last edited by mom of 2 teens; 12-31-2018 at 07:55 AM..
Are you talking about the December Deluxe item in the box? 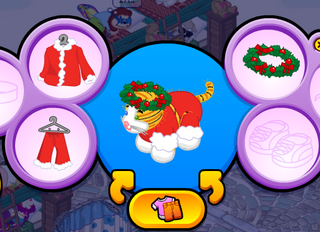 Wreath hat more than the item in the box which I can just send you, Mom2T, make sure you get your 10 medallions. Anyone can make sure all the other items you can get. Ice cube glasses more than the item in the box which I can just send you, Mom2T, make sure you get your 10 medallions. Anyone can make sure all the other items you can get. Thanks Dixiepup but I am suppose to get my box on the 30th my birthday gift to me on auto-renew. It said Congratulation! Your Webkinz World Deluxe Membership has been extended until December 30, 2019! But like a couple of years past the box is a no show. I got to see if the will move my renewal date to the first of December. Mom2T, the December gift was a Wreath Hat!! I am sorry for getting the wrong item. I just usually open these things and pay no attention to them, but this time ... I messed up. It is a Christmas wreath that the pet wears.